Bacon goes excellently with pesto. Bacon goes excellently with everything, including pesto. I am definitely an ardent student of the second school of thought. As the book I am presently enjoying indicates, I am a lover of anything pork. Bacon, with its streaks of gorgeous fat and hypnotic smoky flavor, is high on my list of porcine delights (with this at the top). Which is why, when I heard that this month’s round of Hay Hay it’s Donna Day was to be all about gnocchi, and I have never made gnocchi before***, I decided to call in the bacon…you know, just in case 😉 If there were any accidents, at least I would have the bacon to act as delicious camouflage. Gnocchi. Although the recipe our lovely host Lynnylu posted was for a gnocchi made with ricotta (yum! ), I decided to go with potato gnocchi for my first time. As luck would have it, I found a basic recipe for potato gnocchi in (surprise! surprise!) Donna Hay Magazine’s Winter 2007 issue…complete with how-to pictures and tips! Yay! Being a first attempt, I had no idea what to expect, how finely the potatoes needed to be mashed, how the dough was suppose to feel…everything was done on a wing and a prayer. I do not own a potato ricer or food mill, so all “mashing” was done with a fork, and I started to worry that the mash wasn’t smooth enough. Then, as the dough came together, it seemed very sticky (added some flour to that) and soft. As I cut the gnocchi, I feared that they would fall apart once I dropped them in the water…they seemed a little too delicate. Well, there was nothing I could do now but hope for the best, so into a saucepan of rapidly boiling water they went. After a few nerve-wracking moments, the little lumps floated to that top. That’s it? Where they done? I fished one out and poked it…felt firm. Crossing my fingers I took them out and let them drain. For the sauce, as mentioned above, I wanted bacon to play a part – hopefully masking any disasters if needed. I decided on a bacon-pesto sauce as I believe it’s a pairing made in heaven (try bacon+pesto+broad beans…excellent side dish!). I made rocket (arugula) pesto, because I love arugula and I wanted something different from the usual basil pesto (simply substitute rocket for the basil in your favorite pesto recipe). For the bacon, I used some of a just-acquired batch of Tyrolean bacon (so good!). – Place the potatoes on a baking tray and bake in a 180C oven until soft inside and crispy on the outside (about 1 hour or more). – When potatoes are soft, allow to cool slightly. Cut them in half while still warm (but easy to handle) and scoop the flesh into a bowl, and mash until smooth. – Add the parmesan and flour and stir to combine. Add egg yolk and stir until mixture comes together and leaves the sides of the bowl. – Turn out the dough onto a lightly floured surface and knead for one minute until a soft dough forms (my dough was too sticky so I added a little flour at this point). – Divide the dough into half and roll each half into a long rope about 2-2.5 cm in diameter. Cut into 2 cm pieces and place on a lightly floured tray. – Cook gnocchi in batches in a large saucepan of salted boiling water. Once you dropped the gnocchi in, do not stir or touch it…wait until it floats to the top and is firm to the touch, then it’s done. Drain and keep warm. – In a skillet, heat a small amount of olive oil, and then add the bacon. Once bacon has released some of its fat, add the gnocchi and fry quickly until the sides lose some of its paleness. Take pan off the heat, add pesto, and toss gently to coat. – Transfer to a plate, dot with ricotta cheese (please be more generous than I was in the photo above) and serve. I was pleasantly surprised with the outcome of my first foray into gnocchi-land. Despite a seemingly too-delicate dough, and my serious lack of special implements, once the little lumps where plopped into the boiling water, something miraculously righted itself and passable gnocchi emerged – soft and starchy but also firm and chewy. They did look depressingly pale at first, but I fixed that by frying them a little in the bacon fat (as I fix most of life’s problems). Also, I think I may make them smaller next time…these ones were a tad too hefty for me. The rocket pesto was a dream…if you like arugula, you have got to try it in your pesto! 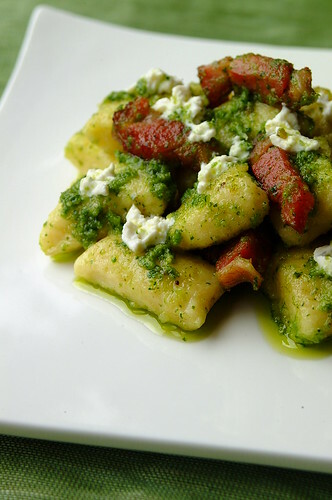 The Tyrolean bacon was a discovery…lightly smoky and salty, it was perfect with the pesto and the doughy-ness of the gnocchi.